Today, we roll out the first release of 2018 that marks the third anniversary of our first technical public preview. Since January 2015, we have evolved, and it all can be summed up in one phrase — we are always improving. 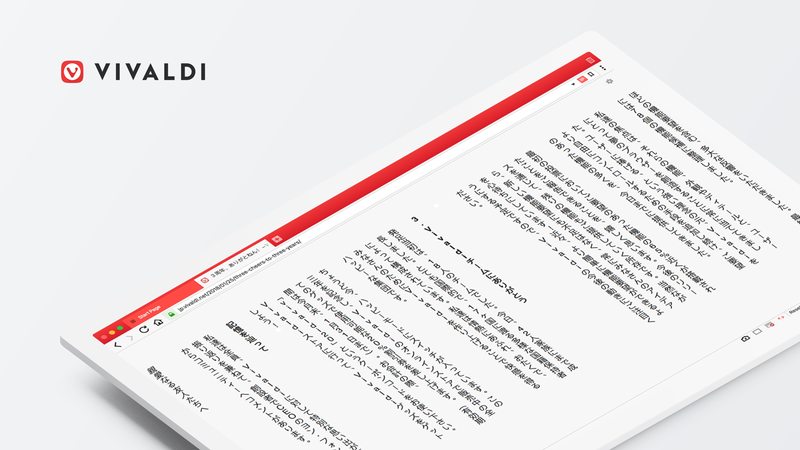 The new additions in version 1.14 respond directly to the needs of Vivaldi users: vertical reader mode, Markdown support to Notes, rearrangeable Web Panels and reordering of search engines. Vivaldi’s Reader View cuts out the clutter and helps you focus on the part that matters – the content. 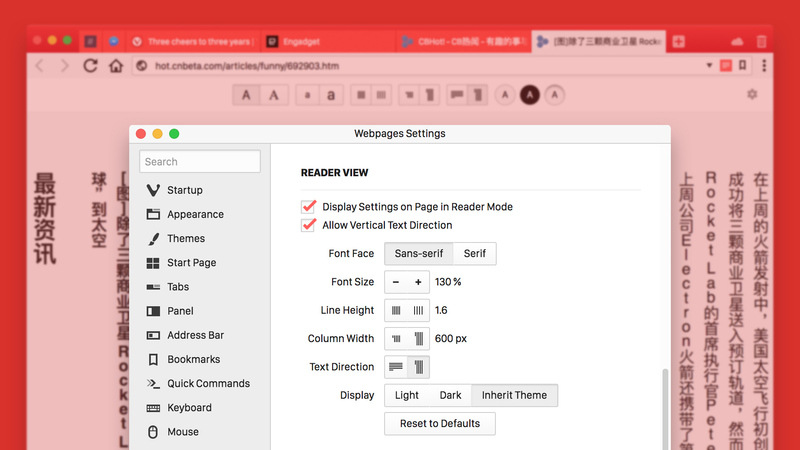 It lets you increase the font size, adjust the line height and column width, and switch to dark or light background for easier reading on the Web. We continue to innovate in this space and in this release introduce vertical reader mode, a first for browsers. This unique functionality came about as a response to needs of users of Chinese, Japanese and Korean languages. No matter where you live or what language you read or write, your individual requirements are vital to us. A vertical display is one of the default ways to view written text in East Asian languages. We are confident that if you use any of these languages, the option to use vertical reader mode will be a useful addition. Now you can read texts in these languages comfortably with no distracting page elements. The vertical orientation is also a great use of your screen’s real estate. Select your reading preference by heading to Webpages in Settings and click on vertical text direction to try it out. 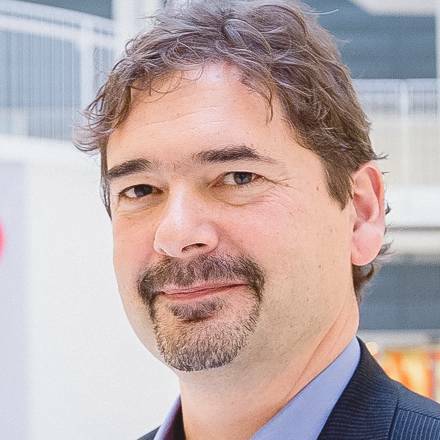 Go native, rely less on add-ons! With this in mind, we have built many differentiating features over the past three years. One of our signature features, Notes has been significantly improved. Notes are useful as you can write them in the left-hand column while you research the Web, add a screenshot of the site you are browsing and even capture a selected area of text. In version 1.14, you can now add formatting to your Notes by using Markdown. Markdown is an efficient and intuitive way to apply formattingused by many sites including GitHub, Reddit Stack Exchange, the Vivaldi forums and many more. This upgrade to Notes makes the feature even more interesting and productive. Now, you can quickly and instantly format text by adding headers, bolding and bulleted lists to your notes while surfing the web. This way you can organise notes, compose emails, to-do lists and more. You can use Notes to write longer emails, novels, and pretty much all other types of text documents. In addition to Markdown formatting, you can also use this option to preview simple HTML. Vivaldi’s Web Panels have been a favourite for many users and have been much appreciated from the very beginning. And we are always on a lookout for ways to improve this nifty, time-saving tool which lets you quickly browse social media or news sites without switching tabs. You can even set custom widths per site in the sidebar so that the size of your sidebar adjusts depending on the panel being viewed. In Vivaldi 1.14, you have now the ability to customize the order of the Web Panels in the sidebar of your browser. This way you can choose your web pages on the fly to make your browsing more interactive and convenient. 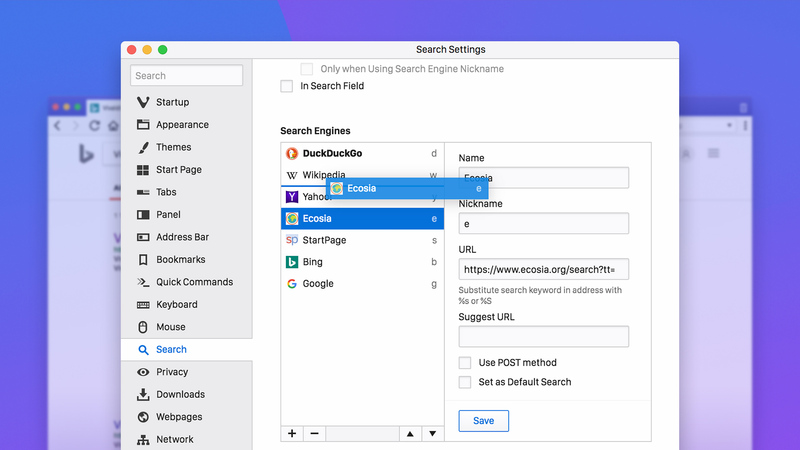 Vivaldi gives you multiple options for searching the web such as the ability to add your preferred search engines or select from an array of default alternatives like privacy-friendly DuckDuckGo or eco-conscious Ecosia. Or, use nicknames to quickly search using a chosen engine without any fuss (e.g. preceding your search term with “w ” to search wikipedia). One of the most-requested functionalities makes its way into the latest version care of your feedback. You can now change the order of your search engines, adding more flexibility to your setup. With the new list layout, you can drag-n-drop (or use the keyboard) to put search engines in the order you want, with ease. We are excited about 2018 and what this year will bring. We are continually evolving, and this is not the end of our evolution in progressive and modern browsing. We have a clear vision that will carry through 2018. 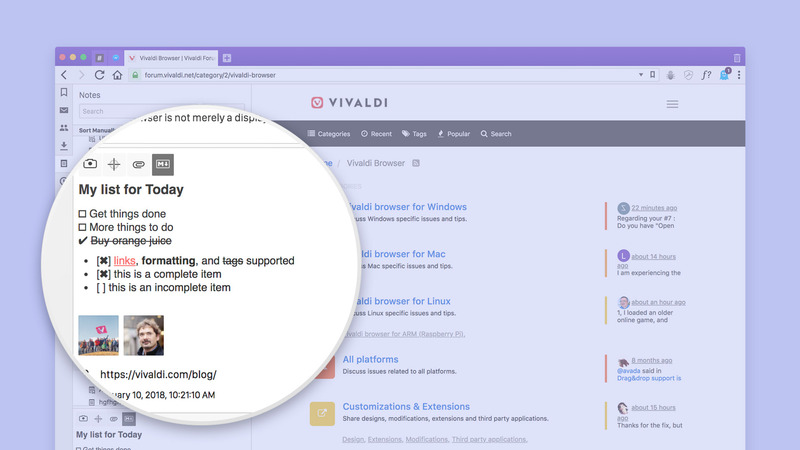 We will keep finding ways to refine and improve Vivaldi and add new features. And, this is what keeps us busy all the time. 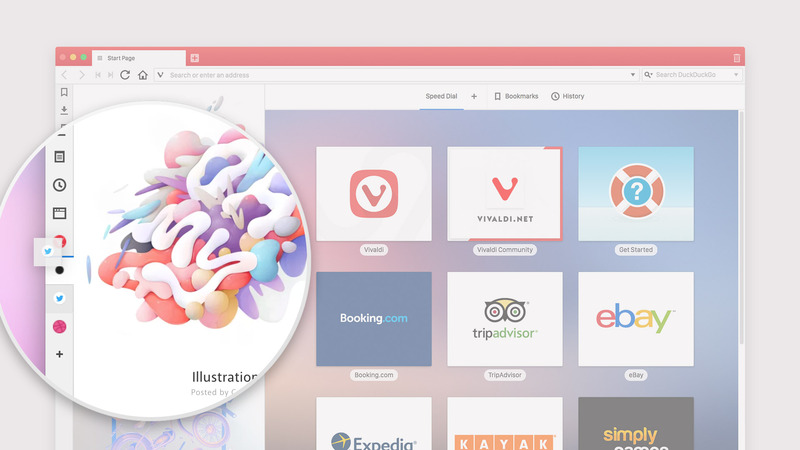 Speaking of new features, today we are introducing a new way to request features in Vivaldi browser. We’ve created a Feature Request category on the forum which should make things easier in at least a couple of ways. First, you won’t have to transfer feature requests between releases (post once and see those upvotes go up!) and, second, you’ll now be able to discuss the requested features – something you’ve wanted for a while. Take a look at the Help page about this, it’s a step-by-step guide on how to post feature requests. As always, keep sending us your feedback. Enjoy version 1.14 and let us know what you think.